I bet many young students embarking on a study of Shakespeare would be quite shocked to know that they already “speak" some Shakespearean language in their everyday lives. I am not merely referring to students who are able to say “Oh Romeo, Romeo" as they look over a balcony or to utter “To be or not to be", whenever someone mentions the Bard. Quoting Shakespeare and speaking his words with literal meaning behind it are two very different things and any lesson taught on Shakespeare would be off to an excellent start if it began with this insight into his language. 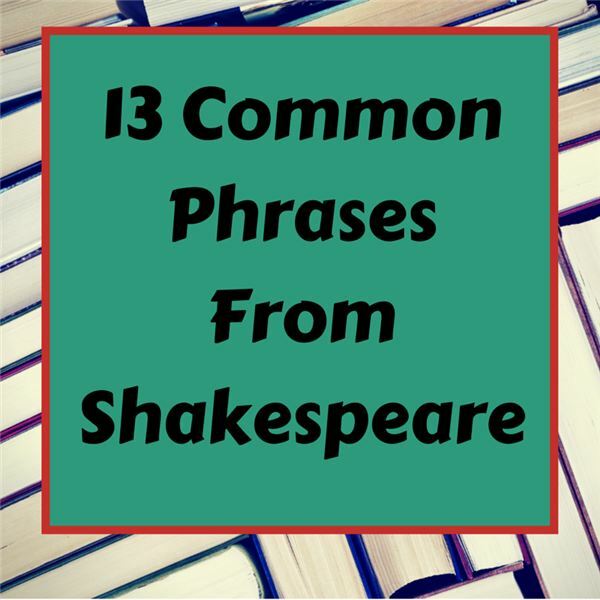 Thirteen phrases from eleven of Shakespeare’s works have made it into our common vernacular since they were first written down. Some have retained their original meaning from the work in which they were first uttered and some have adapted and shifted over time. My personal favorite and the one that my students are often most impressed with, is that the idea of catching a cold, or having a cold, is something that was foreign before Shakespeare wrote of the concept. People got sick, sure, before he coined the phrase, but the common cold was not called a cold before Shakespeare named it thus! These insights and more are contained within the downloadable power point. The lesson is brief enough to be taught in a single class period and simple enough for grades 6th and up to comprehend. Each slide names the play from which the phrase derives, the quote from the play and the meaning of the phrase now. Also included, both for fun and reference are still shots of the plays mentioned. If this lesson doesn’t spark an interest in Shakespeare’s gift of turning a phrase, I do not know what will!